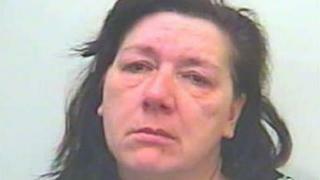 Cornwall woman Sandra Clinch has been jailed for fatally stabbing her husband Alan with a pair of scissors in a row about tidying their house. A jury at Truro Crown Court convicted Clinch, 49, of manslaughter on the grounds of diminished responsibility. In court, she presented herself as the loving mother and wife whose temper occasionally got the better of her. But softly-spoken Clinch was a violent woman, prone to screaming at strangers and neighbours and with a reputation for taking matters into her own hands. She once drove her car at a teenage friend of one of her daughters, stabbed a former husband in the leg and wounded another in the hand. Her children told the court she had also used a shower head, a porcelain bowl or a glass picture as weapons. One young neighbour referred to the 49-year-old as "the Incredible Hulk". On the day Alan Clinch was killed, Clinch was enraged that her quiet, gentle and slightly-built fourth husband would not immediately comply with her orders to tidy up the house. She grabbed the scissors and plunged them into Mr Clinch's chest. Clinch, whose five children were from four different fathers, wept at regular intervals in the dock. She wiped the tears from her eyes as she recalled the way her late husband would put his arms around her to soothe her whenever she showed the first signs of rage. Yet her gaze remained fixed away from the witness box as each of her children gave evidence against a mother prone, they said, to hitting, punching and kicking. Pregnant with her first child at 15 while in care, Clinch married her first husband, Andrew Fazekas, in 1981. The night before their wedding, she tore down Christmas decorations and cut the telephone cable after engaging in a violent row with her fiance. Before their divorce three years later, Mr Fazekas had already written in his diary about how her temper resulted in her stabbing him in the hand. Neighbours in the tiny community of Darite also heard Clinch shout, scream and throw things at her husband, who they said had appeared solemn and withdrawn in the six months prior to his death. Yet further evidence, this time from Clinch's mother, offered a more disturbing insight into the mind of a troubled teenage girl. The court heard how Clinch's mother highlighted her child's violent unpredictability, telling social services nearly four decades ago how she suspected her daughter would one day be responsible for murder. Ken Wilkins of Esteem, which supports male victims of domestic violence in Cornwall, said: "There is still a perception in society today that regards domestic abuse against men as a bit of a joke and that can be very detrimental to men having the confidence to come forward."